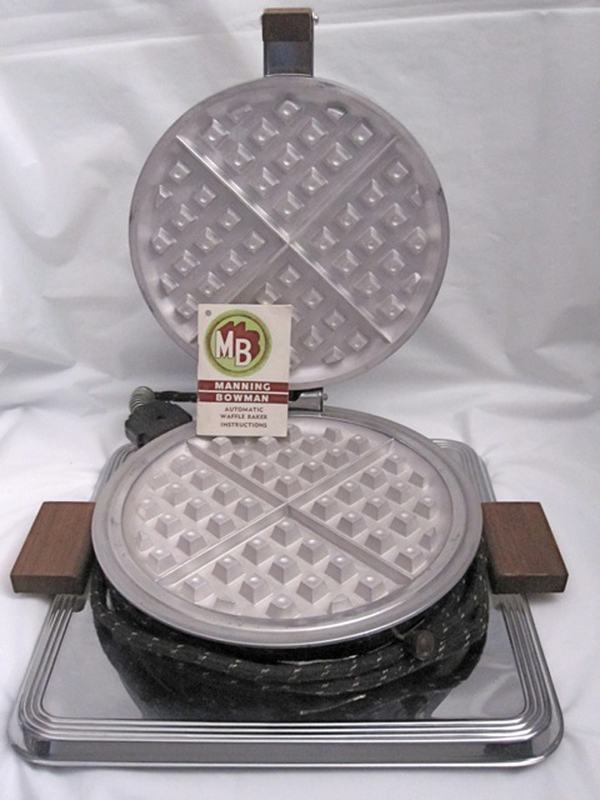 Let's Take a Trip Inside Your Waffle Iron! In addition to Waffles, we have a Calendar of Swing Dancing in DC, a Directory of Vintage Clothing Stores and a Guide to 1940s Collectibles. Thanks for tuning in! Feel free to Contact Me if you have questions or want to share photographs and appliance stories with the rest of the readers. Is there a connection between Swing Dancing and Waffles? You bet there is! It comes in the form of Wells Famous Restaurant in Harlem -- during the Harlem Renaissance, Wells was open 24/7 and attracted may late-night/early morning customers hungry after a night on the town. The specialty of the house was fried chicken and waffles, something that was mid-way between dinner and breakfast. "... No appetites are safe from the magnificent Southern Creole cuisine when visiting Wells restaurant, located uptown in the Big Apple. Famous for more than their chicken and waffles, Wells entertains customers with Caribbean flair and a frenzy of live music. Harlem hasn't been the same since Wells opened in May 1938. The owner, Elizabeth Wells, is determined to bring people a humble, homey atmosphere with exciting home-style cooking, but with a twist of island flavor and a lot of fun. Joseph T. Wells, the late husband of Wells, had a record of cooking techniques in the mix. Working as a waiter and manager of a restaurant in Florida, Joseph took his craft to New York during the late 1920s. It was inevitable for the young entrepreneur to start his business and, by the spring of 1938, the restaurant bearing his name opened its doors. Elizabeth Wells entered the picture later. They married in 1966, even though she had joined the establishment in 1963. The married couple produced a son named Tommy Wells. With an avalanche of victory for the restaurant, Wells bloomed as one of the greatest hot spots in Harlem, with a bevy of entertainers who dropped in...Wells has been spinning the wheels of the restaurant with tip-top soul food and no regrets..."
Wells was known for jazz, waffles, and celebrities throughout the 30s, 40s and 50s. One story about Well's seems to be widely told and re-told. During late 1950s, Sammy Davis, Jr. and Kim Novak were dating. One morning after breakfast at Wells' Kim's fur coat was found to be "missing" from the coat-room. Frank Sinatra made a stern announcement to the crowd about the missing coat and it appeared back the next day. In 1986, the folks at Wells took out a trademark on their famous slogan "Home of Chicken and Waffles Since 1938". 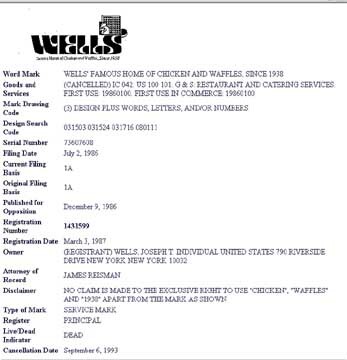 We note that their trademark only applies to their graphic logo and they have not attempted to restrict the use of "chicken" "waffles" or "1938" only that they have been "famous" for the dish since 1938. Wells continued to play a role even during the Swing Revival of the 1990s. On Monday nights, the Harlem Renaissance Orchestra played in a small corner of the restaurant and many of the original Lindy Hoppers (including Norma Miller and Frankie Manning) were regulars, joined by whatever newcomers (like the Rhythm Hot Shots) may have been in town. I made the pilgrimage to Wells in 1998. I loved the fried chicken and waffles, but I was not so thrilled about the carpet on the dance floor. I have heard rumors that Wells may have closed its doors. If so, this would be a real tragedy. If any of our readers can clarify this point, pelase contact me. Those of you with a taste for chcken and waffles may find them at equally famous places like Roscoe's in Los Angeles and Gladys Knight's Place in Atlanta. Essentially, waffles are a form of griddle-cake based on flour, milk, eggs, butter, oil and leavening that are cooked on both sides simultaneously in a mold that takes the form of a gridded surface. Because of the "teeth and gaps" of the waffle mold or "iron", considerably more of the surface area is heated and caramelized relative to the "pancake" -- thus, the waffle has more taste and a crispness that enables it to serve as a support for other foods. Waffles serve many of the same roles in sweets as toast serves in savories. Waffles began in the high cusine of Europe and came to America by way of Thomas Jefferson who brought a waffle iron back from France in the 1790s. Since Mr. Jefferson (author of the Declaration of Independence) relied on slaves for his cooking, skill at making waffles soon spread to the African-American community. Recipes for both Waffles and Fried Chicken appear in What Mrs. Fisher Knows About Old Southern Cooking, (Abby Fisher, 1881). Mrs. Fisher was a former slave and her book is generally considered the first cookbook written by an African-American. Apparently, white people were eating waffles and fried chicken as well as recipes for the two appear in Mrs. Porter's Southern Cookery Book published in 1871. Among the slaves, whose cuisine was based almost entirely on the scraps left behind by landowners and plantation families, poultry was a rare delicacy. Similarly, waffles were unusual, expensive and time-consuming, and hence exotic. As a result, chicken and waffles came to be a special-occasion meal in African American families, often supplying a hearty Sunday morning meal before a long day in church. 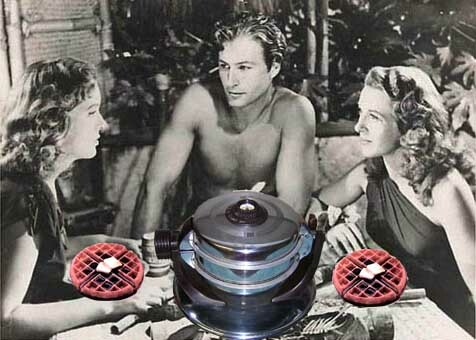 Our survey of waffle technology is going to focus on my Manning-Bowman "Twin-o-Matic" machine. 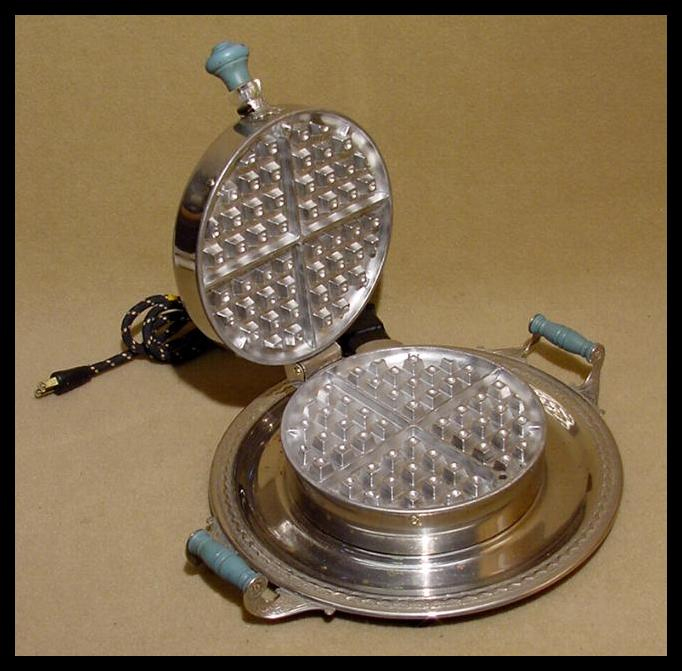 It has all the general characteristics of electric waffle-makers with the unusual feature that it can make two at one time. IF you have another kind of machine, it will have the same basic structure as the "Twin-O-Matic" with only half the components. 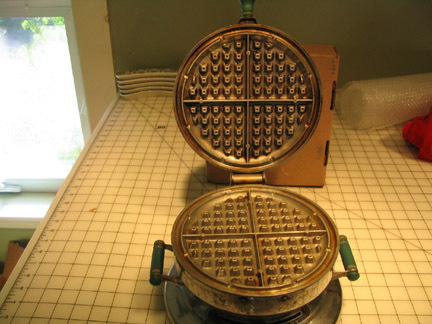 The mold that is used to cook waffles is a heavy, heat-retaining device with a top and bottom compartment. The mold is gridded in a rectangular fashion such that protrusions on the top portion are complemented by depressions in the bottom (and vice versa). 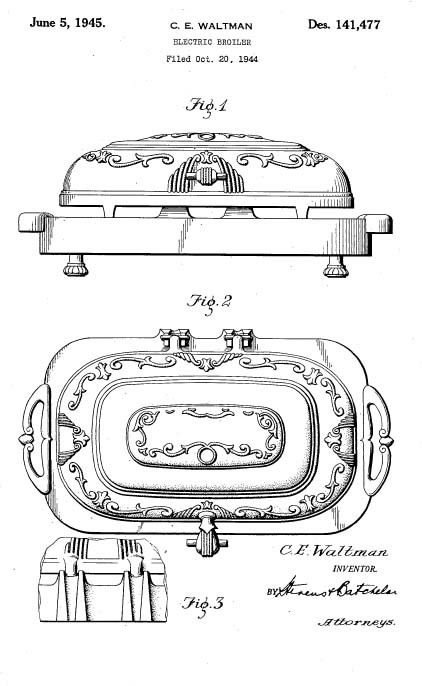 Because waffle molds were historically made out of cast iron, the device has come to be known as a "Waffle Iron". 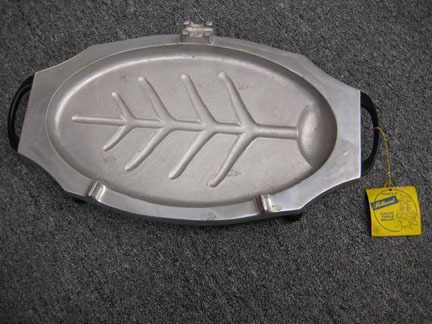 Today, aluminum and steel are the principal metals used to manufacture waffle "irons". 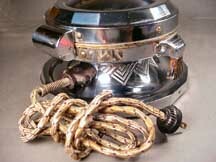 Historical waffle irons go back to the 15th century and possibly before. 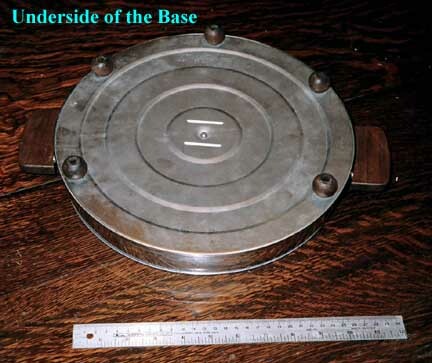 Like many utensils, the design and production of waffle irons was a matter between the customer and his blacksmith. 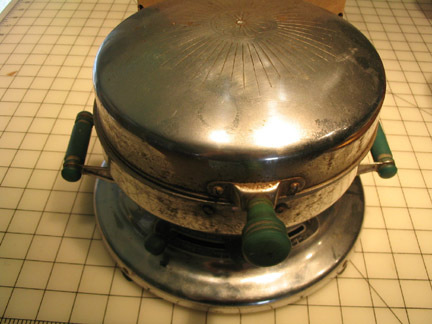 The closest thing to an old-fashioned non-electric waffle iron is the pizelle maker. Pizzelle (pronounced "pit-sell") are Italian wafer cookies. The name comes from the Italian pizze for round and flat. Many different cultures have adapted this technology and re-named it accordingly. In Scandinavia they are also known as "Lukken" and in Holland as Krumcake. 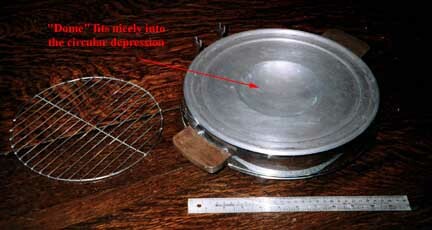 All use an iron similar iron to the pizzelle. 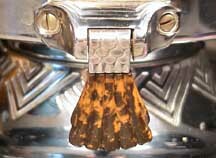 The long handles are used to open the mold and then hold it over a fire. Considerable skill is required to know when to put the dough into the mold and when to take it off the fire. After years of practice, I now only burn about 10% of the pizzelle that I attempt. In the case of waffles, electric technology is much better, and we shall move to that forthwith. This did the job, but it sure wasn't streamlined. Here is a photo from a World War II era training pamphlet. The subject was "How to use electrical appliances." Many rural households were just getting electricity due to the Rural Electrification Administration (REA) and the pamphlet was intended to get folks up to speed with the rest of the country. 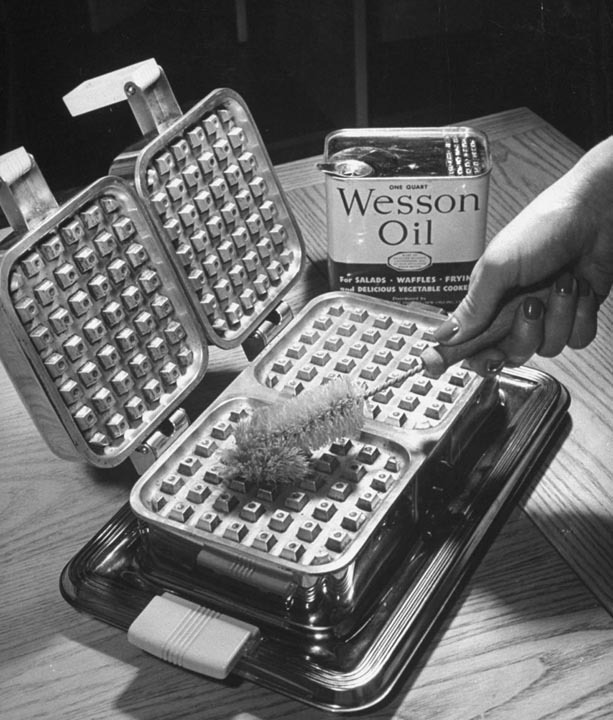 This photo shows the Government-approved method of "seasoning" a waffle iron (you put oil on it and let is burn in, creating the organic equivalent of Teflon). Any vegetable oil will do. There are a zillion waffle irons. 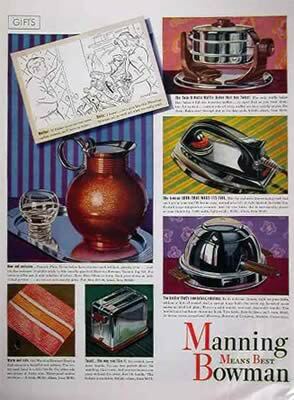 I own a bunch of them, but my favorite is the Manning-Bowman "Twin-O-Matic" both because of its unusual design and the way that it implicitly fosters "togetherness." 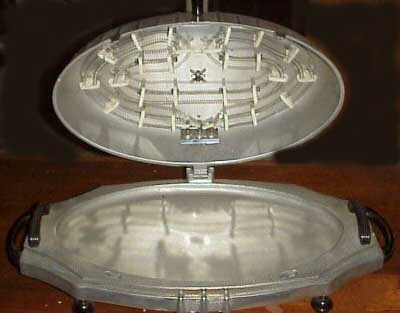 The "twin" was designed by Karl Ratliff explicitly for the 1939 NEW YORK WORLDS FAIR. The Twin is a direct descendant of Mr. Cole's design but with an added Art Deco zest. 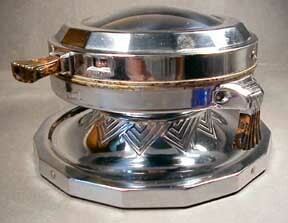 This unique design won world awards and is the ONLY waffle iron shown in Tony Fusco's noted "ART DECO" BOOK, Volumes 1 and 2. 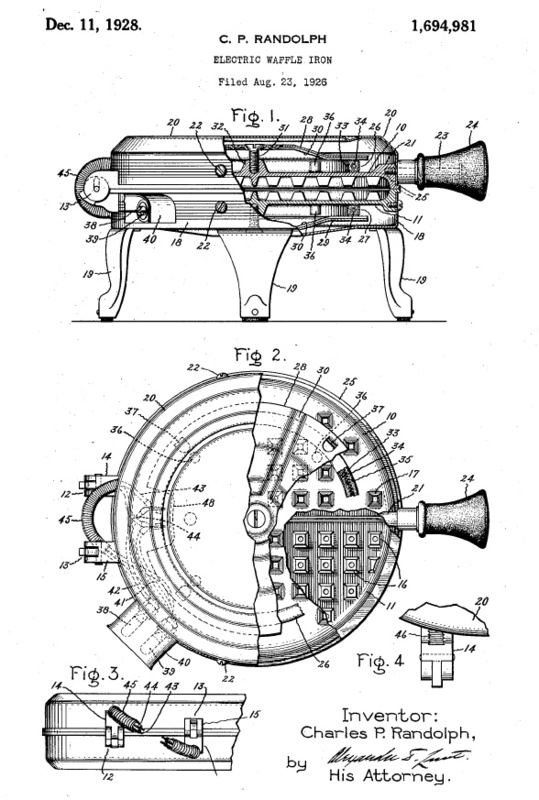 It consists of 2 pieces: a double TOP/BOTTOM Waffle Iron derived from the Coles patent (above) and a circular chrome plated "trunion mount" that has 2 heavy Bakelite Cradles to support the irons. It is somewhat unique because it has both a Thermometer and a Thermostat. 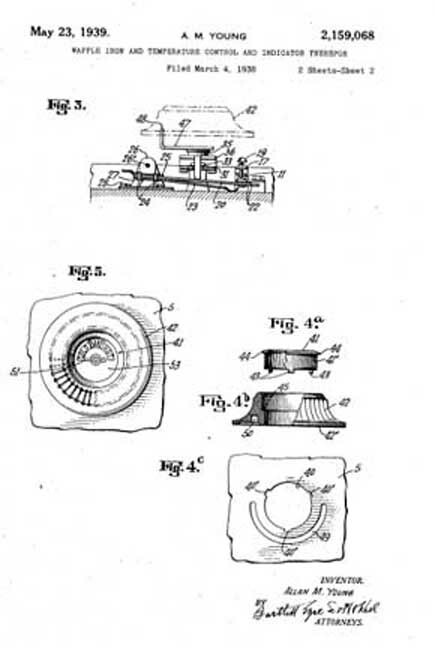 Karl Ratliff Patent No. 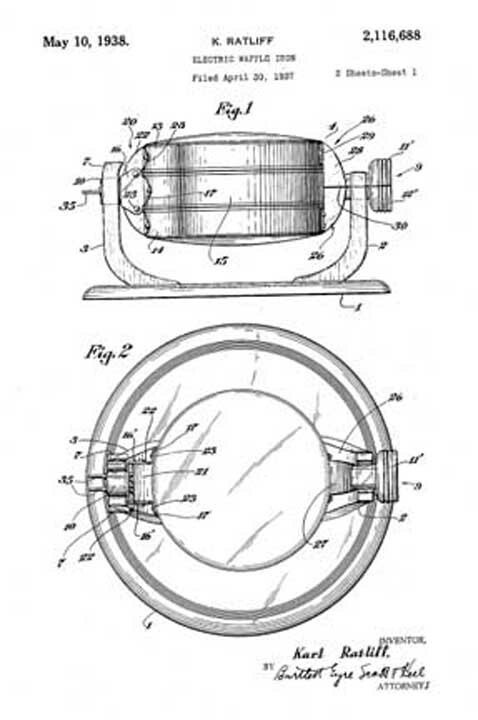 2,116,688 for the "Twinover"
Manning-Bowman made a similar version, known as the "Twinover". 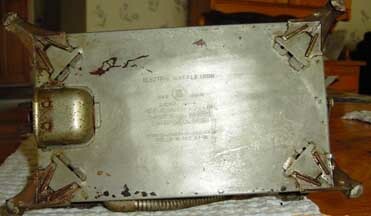 The two appear to be very similar with the sole exception that the "Twin-O-Matic" has a raised bake indicator (shown in the picture.) 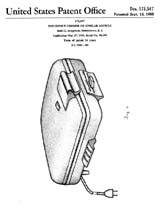 The "Twinover" has a flush bake indicator. 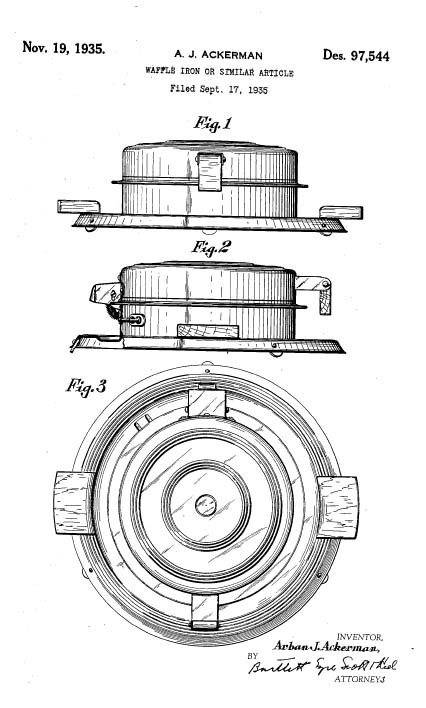 The "Twin-O-Matic" makes two eight inch waffles, as opposed to the 4-6 inch waffles made by other double irons. 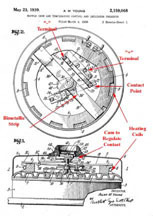 The instructions call for loading the "Top Waffle Section" first (the "top" is the part with the bake indicator). 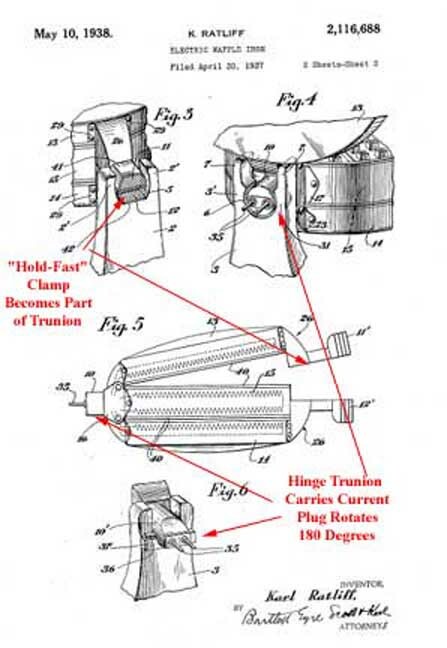 If one wanted a second waffle, you were instructed to wait for 15 seconds to let the first waffle "set" and, rotate the Waffle Iron 180 degrees on the trunion, open the "Hold-Fast" clamp and load the "Bottom Waffle Section." 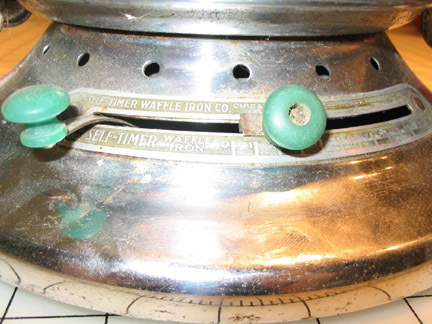 The two sections of the waffle iron are held together with clamps that keep the sections from separating. Because the clamps form part of the trunion mount, there is never any danger that the section that is on the bottom will come open because its clamp part is bearing the weight in the mounting. The upper section may always be easily opened due to the "U" shaped trunion opening. This arrangement is quite clever but contains a small design flaw -- the electrical plug is on the hinge side of the trunion mounting. 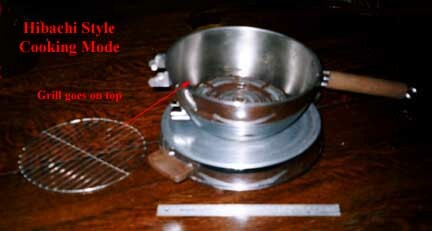 It rotates 180 degrees and in doing so creates a flex in the cord; eventually, the cord will show mechanical failure at the flex-point as illustrated below. 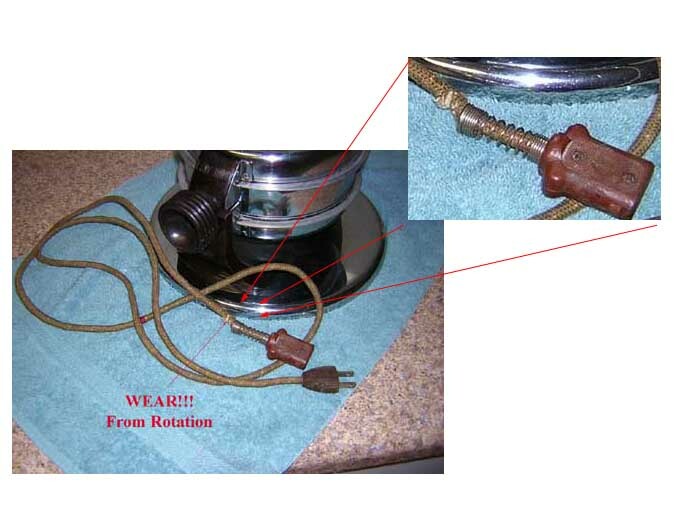 This "flaw" can be used in authenticating the cord that goes with the "Twin-O-Matic". However, safe operation requires an intact and properly insulated cord. 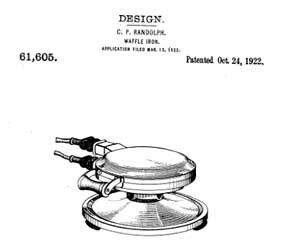 While Mr. Ratliff did a wonderful job on the design of the "Twin-O-Matic", we are indebted to Mr. Alan M. Young, and employee of Manning-Bowman for the "Waffle Iron Temperature Control and Indicator Therefor". The Thermostat uses a bimetallic strip to break the circuit when the desired temperature is reached. This is a strip made up of two metals that have different thermal expansion characteristics, such as steel and copper. If one metal expands faster than the other, the strip will warp -- and the motion caused by this warping can do useful work (like breaking the circuit...) In this case, a cam exerts some force on the bimetallic strip using a spring force to keep the contact in place for varying amounts of temperature. For "high" settings, the bimetallic strip must warp a lot more to break the contact than for "low" settings. When the temperature exceeds the desired setting, the strip "warps" and breaks the contact causing the resistance coils to cool. Because the iron is not being heated, the temperature falls and consequently the bimetallic strip "un-warps" and makes contact again, causing the coils to re-heat the iron. 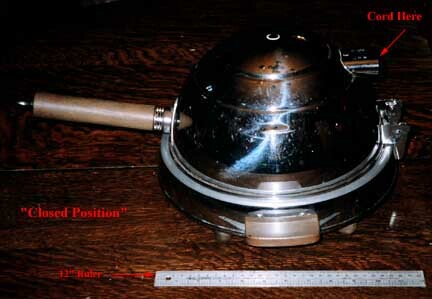 In this way, a continuous temperature is maintained in the cooking irons. This ingenious device is widely used in electrical appliances in one form or another and is quite reliable and cheap to manufacture. 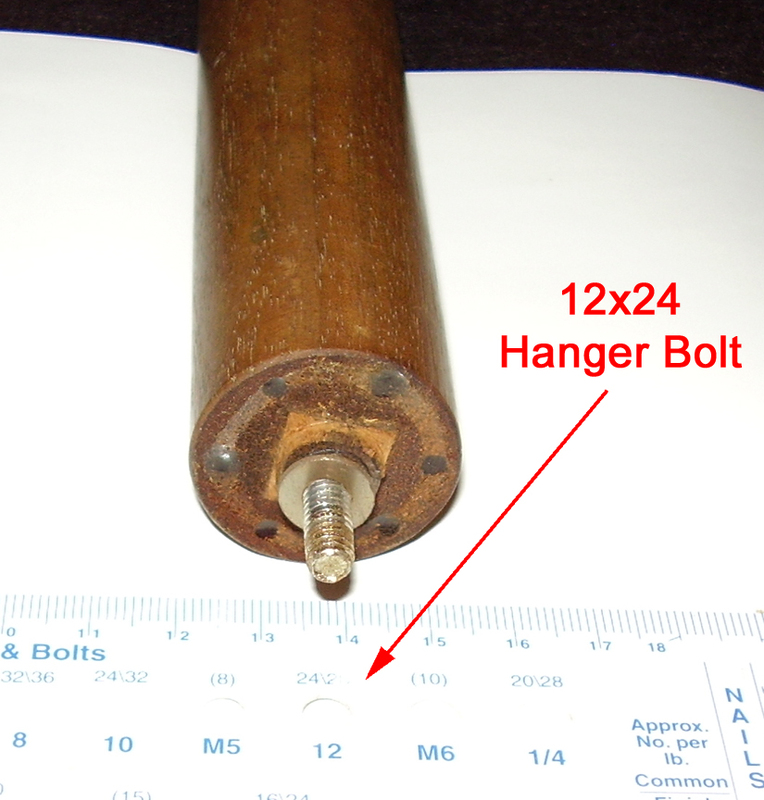 Check out a similar device used to control the temperature in electric irons. 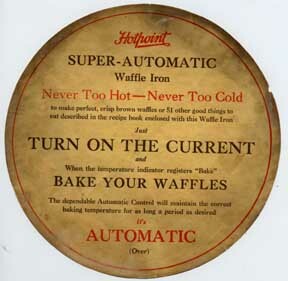 The thermostat allows the automatic control of the temperature in the waffle iron. 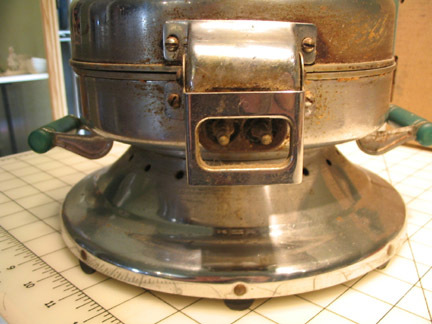 However, the "Twin-O-Matic" also has a thermometer -- a device that indicates the actual temperature of the iron. The principle behing the thermomenter is basically the same - a bimetallic strip is made with the property that its warping is a linear function of temperature. 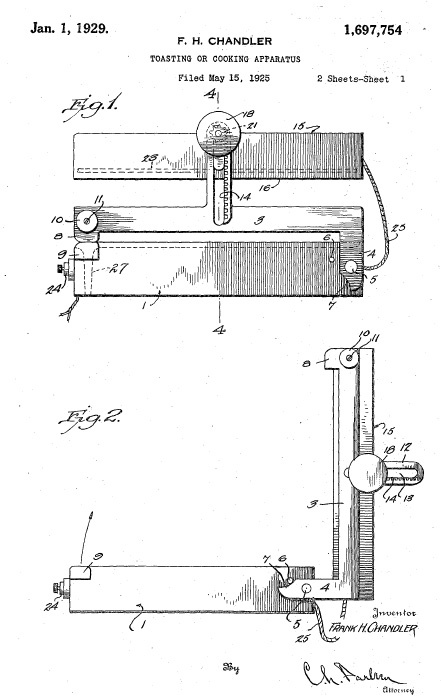 This strip is connected to a lever mechanism that causes the small needle to rotate. Hence, the position of the needle is a direct function of the temperature. The dial is calibrated to reflect this. Of interest is the fact that the thermometer and thermostat are two independent devices that are mounted coaxially in the upper grid. The thermostat only measures heat in the upper section and must be callibrated to reflect heat in both the upper and lower sections. 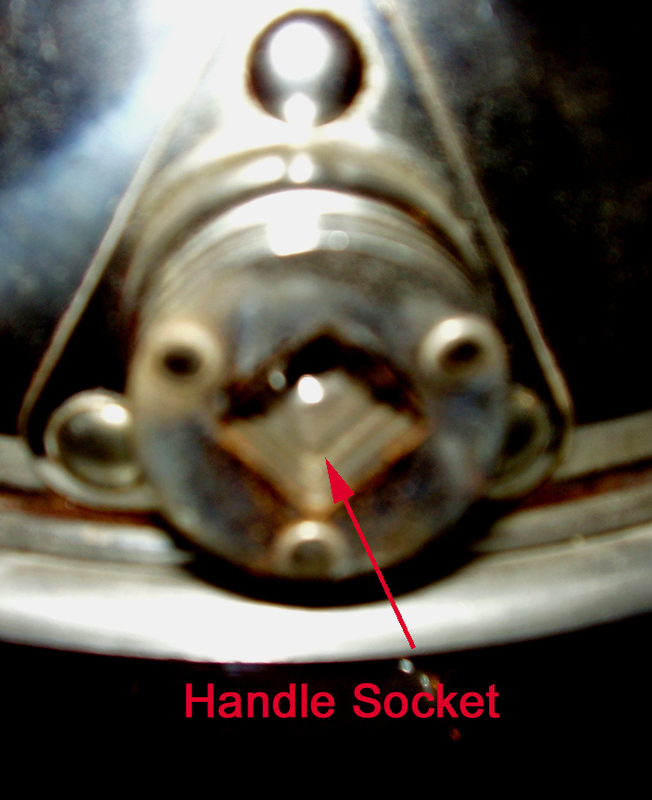 An adjusting screw is provided for this. 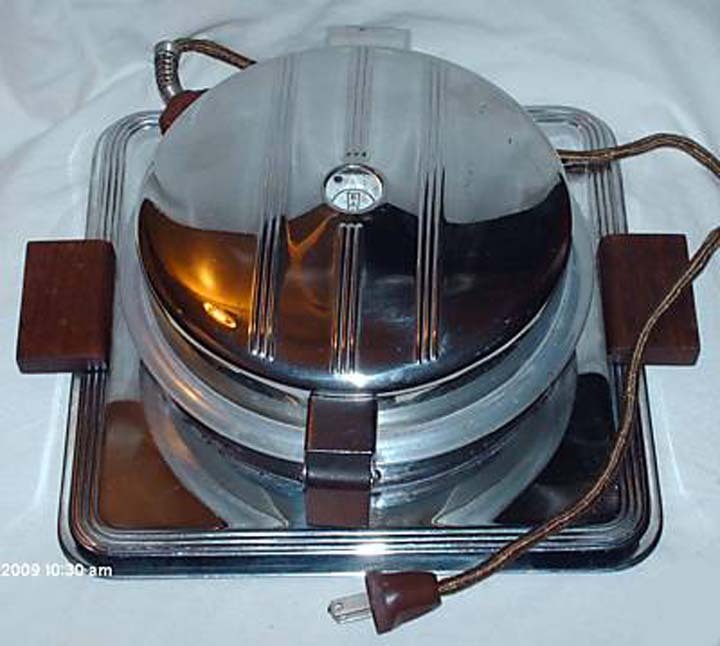 The Twin-O-Matic has Mr. Young's Thermostat that is mounted on the top waffle iron. The thermometer is coaxial with the thermostat. 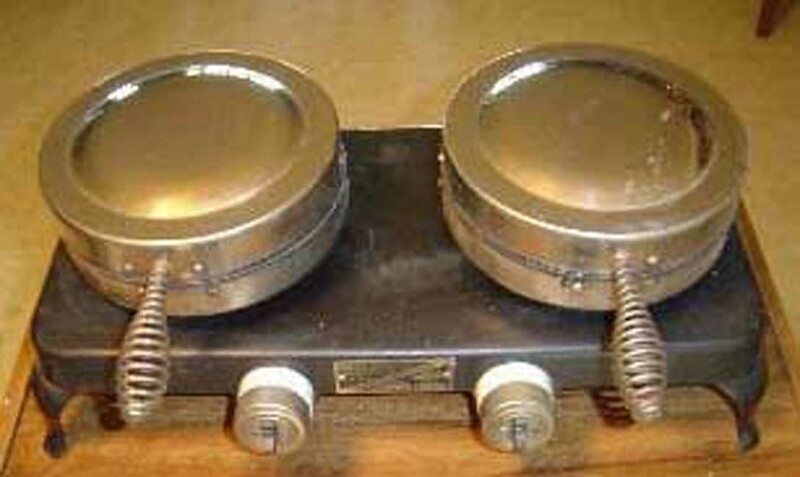 Manning-Bowman made an earlier version of the "Twin" called the "Twinover" that only had the thermometer. Because the "Twinover" is earlier, it may be a bit more valuable than the "Twin-O-Matic", but it lacks the convenience of the Thermostat. If you are an investor, go for the "Twinover" because it is older and rarer. 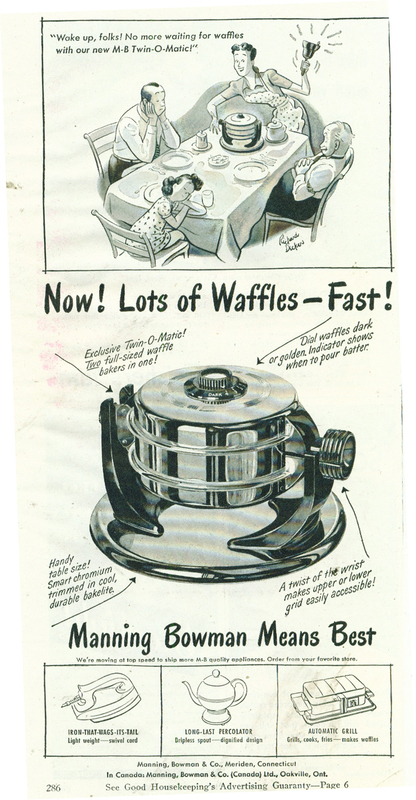 If you want waffles, go for the "Twin-O-Matic." The trunion base is interchangeable between the two models, so it is possible that you might find a Twinover "iron" on a "Twin-O-Matic" trunion (or vice versa) This would most likely lower the value of the combined object. SO -- if you are buying one of these by mail or through an internet auction, please be sure to ask whether the trunion base matches the iron. Alton Brown of the Food Network has a great recipe for a really fantastic made-from-scratch waffle batter. (You can find by using the link or by searching for "waffles" in the "Good Eats" program. Plug the Twin in and wait for the needle on the thermostat to go to "bake"
Open the iron, and spray with "Pam"
Open, spray and add batter to the bottom. DO NOT OPEN the iron until the steam has stopped emanating from between the plates. If you have a Twin-O-Matic, you can set the temperature you want. If you have a Twinover, you have to rely on the thermometer to tell you when to "bake. On both, you'll have to watch the thing so that your waffles don't burn (this is very easy after a small amount of practice). Take the waffles out in the order you poured them. 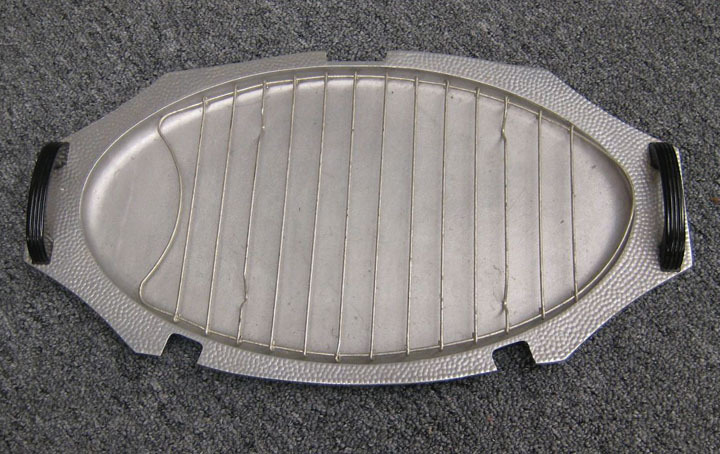 When you clean the iron DO NOT REMOVE the accumulated black coating on the grids. This is Nature's Teflon! If you use chrome polish, don't get any in the grids! About a month ago, the airliner that was supposed to take me to Charlotte had to land in Asheville because of Tropical Storm Fay. The airline put me up at a Marriott Suites hotel. Everything was more-or-less mediocre EXCEPT the breakfast -- they had a modern-day replica of the Twin-o-Matic (with Teflon, of course) There was a machine that dispensed the right amount of batter into a plastic cup which was then taken to the waffle iron. By flipping, you could make two waffles -- the thing was computer controlled. It worked very well. My fellow passengers were either amused (or bored) when I showed them the original item on my website. Only a VERY SMALL number of people are interested in vintage appliances. 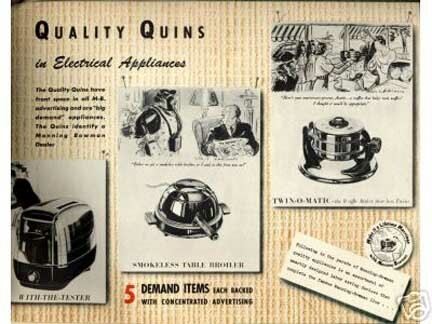 Here are four ads for the Twin-O-Matic. 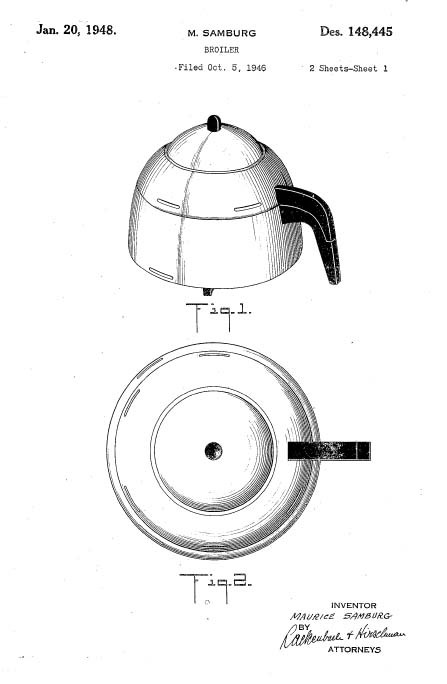 Manning-Bowman always portrayed its products as being used in very fashionable surroundings. If you can't read the third ad, in the Quin cartoon, one Dowager says to the other: "Looks like our cook has been handling these. Thank Goodness I've got an unbreakable percolator." Manning-Bowman products were targeted at the ladies who had time to go to art museums, leaving the dirty work to servants. Note that all four ads are for the "Twin-O-Matic". 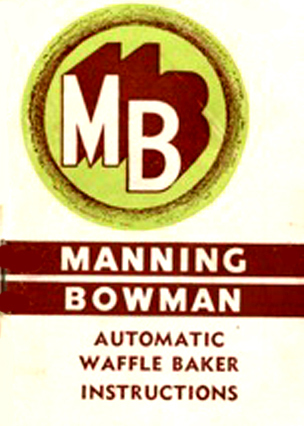 Here is an outdoor advertisement for Manning-Bowman. 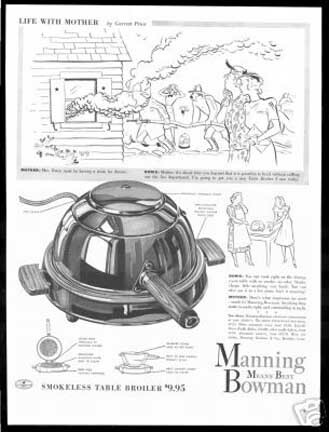 This page outlines the most popular of the Manning-Bowman appliances (including the "Twin-O-Matic") and highlights the national advertising campaign using cartoons by the famous New Yorker cartoonist, Quin Hall. Here is a book jacket by Quin Hall. 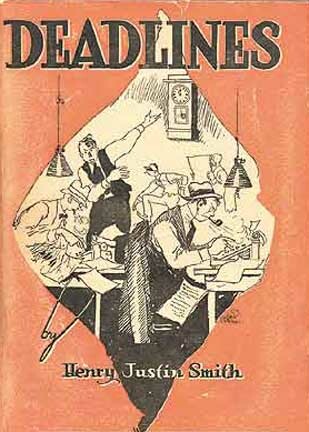 he also had several newspaper cartoon strips, including The Dolittles (1940) and Peter Plink 1948. 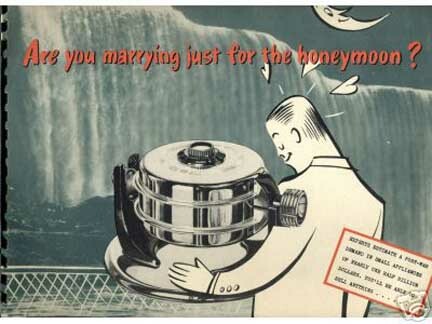 This illustration anthropomorphizes the Twin-O-Matic and notes that post-war demand for small appliances will be a "half billion dollars" (about $100 billion in 2005 dollars), and encourages dealers to sign up to sell Manning-Bowman appliances. 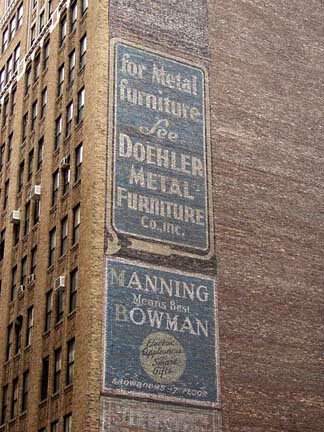 This is actually a very sad artifact, because the Manning-Bowman company was in deep financial distress because they could not get materials -- particularly chrome -- during World War II. This was an attempt to sign up dealers so that credit and financing could be obtained to last out the materiel shortages imposed by the War. It did not work, and soon thereafter, Manning-Bowman sank into a sea of red ink. The company's assets, including its spectacular Art Deco designs, were sold to the Bersted Corporation of Fostoria, Ohio. 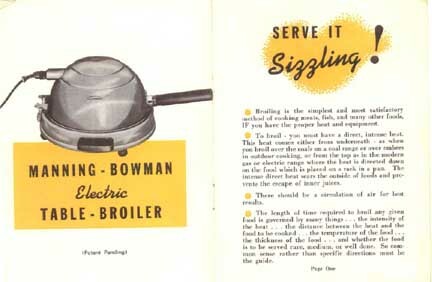 Berstead watered down the designs and made low-priced "drug store" versions of many Manning-Bowman appliances. 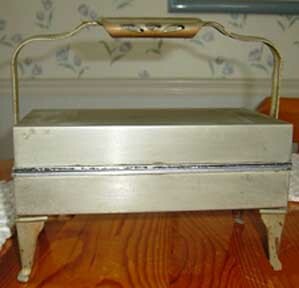 (The Sandwich Grill on our Kitchen Aplliances page is a good example of this "cheapening" process.) Alas, Manning-Bowman met an inglorious end, but it was merely a foretaste of the vast wave of shoddy appliances made in faraway dictatorships that suffocate the American marketplace today. If you have photos or ads that pertain to the Twin-O-Matic, please send them to us! 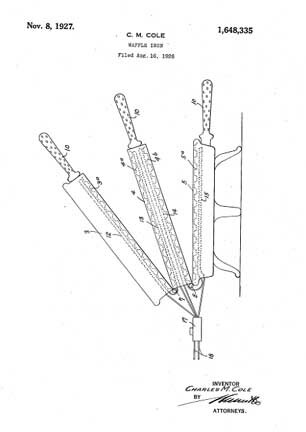 Manning-Bowman also made several elegant irons that only made a single waffle. 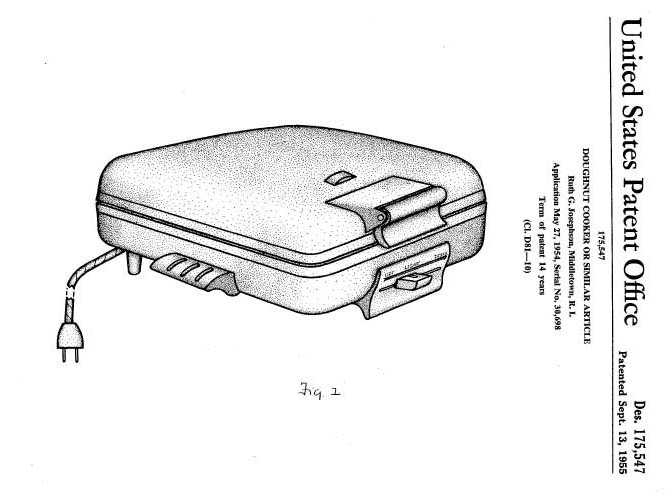 Here are a number of variations on Design patent D - 97,544. "... 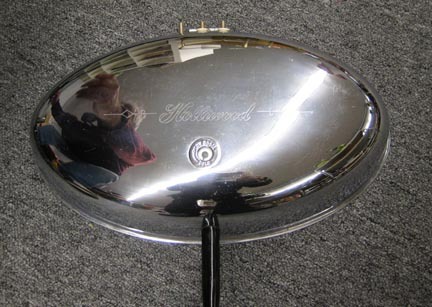 I just purchased a "brand new" (made in July 1940) unused shiny chrome Manning-Bowman waffle iron! What a beautifully designed item. The original booklet was included. There were so many great recipes featured - even "gingerbread Waffle" recipe. I thought you might be interested in a copy of the booklet that I scanned. ..."
After some experimentation, we DEFINITELY commend the gingerbread waffles to you. 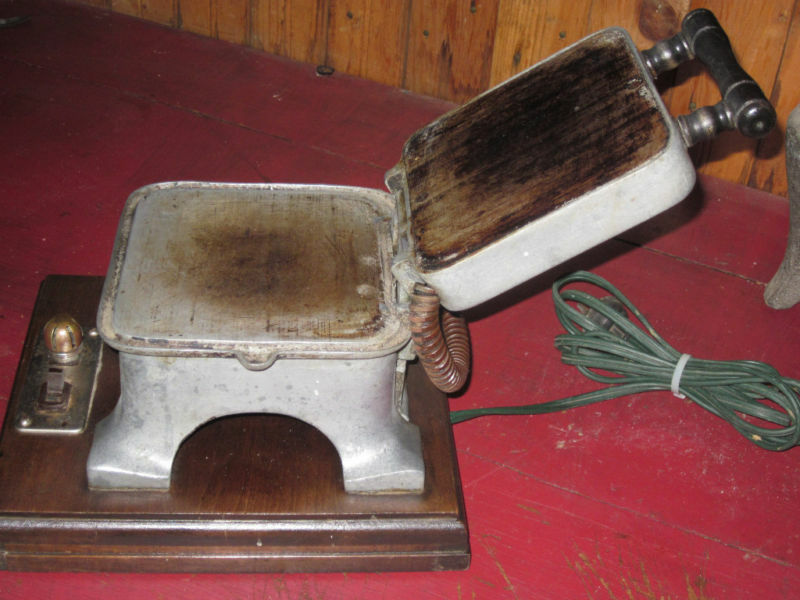 The appliance was designed by Mr. Charles Randolph, an employee of the Edison Electric Company which later became General Electric. "Hotpoint" was the brand name for General Electric appliances. 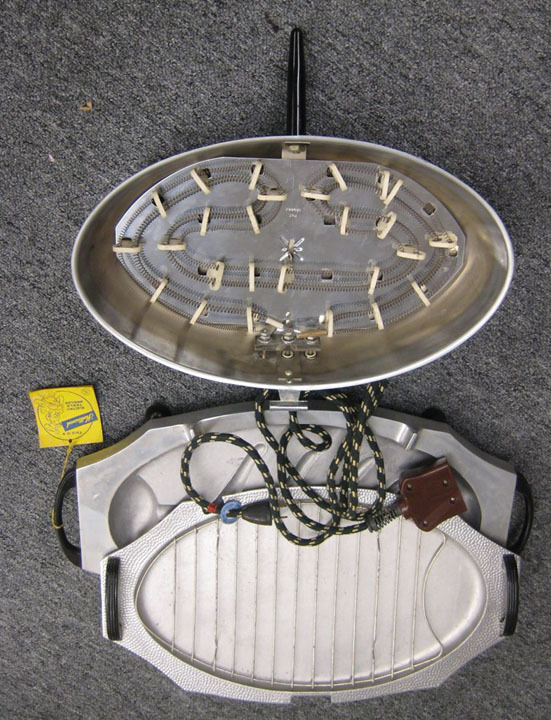 If you have photos or ads that pertain to this Hotpoint waffle iron, please send them to us! In 1887,Thomas Edison built a research laboratory to be devoted to the "rapid and cheap development of inventions." 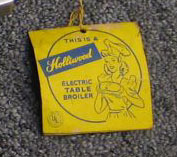 Eventually, about 200 scientists, engineers, and technicians were employed there to invent to order, �useful things that every man woman and child wants� at a price they can afford to pay.� The "Edicraft" line came close to fitting this paradigm -- it was developed in the late 1920s when electric appliances were a growing industry that generated high profits. The "Edicraft" line included a clamshell type toaster, a sandwich grill, a waffle iron [below], a combination grill/waffle iron and a coffee urn/water heater (the �Siphonator�.) The entire line was of high quality but were expensive, on the order of $25 per unit -- equivalent to $800 in 2011! 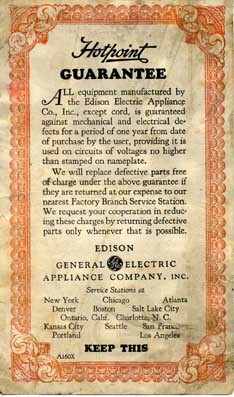 The Edison Company stopped production of appliances in 1934. 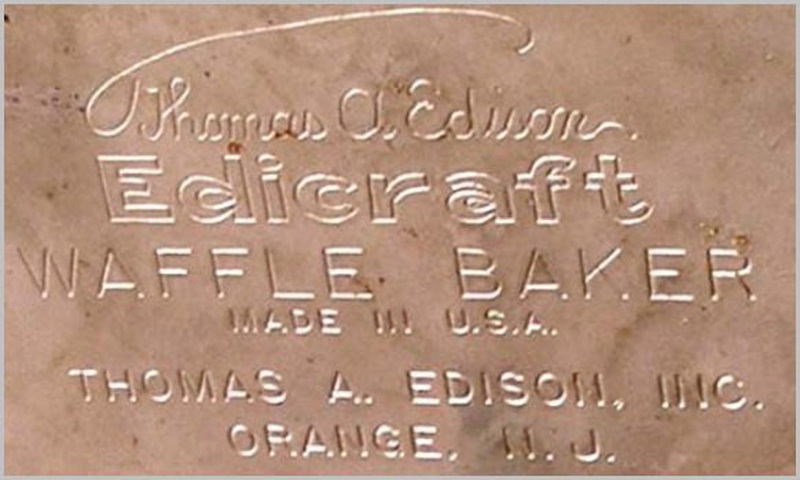 Edison died in 1931, at age 84, but his company, Thomas A. Edison Inc., remained in business until 1957 when it became a subsidiary of McGraw-Electric. Charles V. Champion, Sr. invented the "Tostwich," a combination electric toaster and sandwich maker intended for commercial use. He also produced corn popping machines. 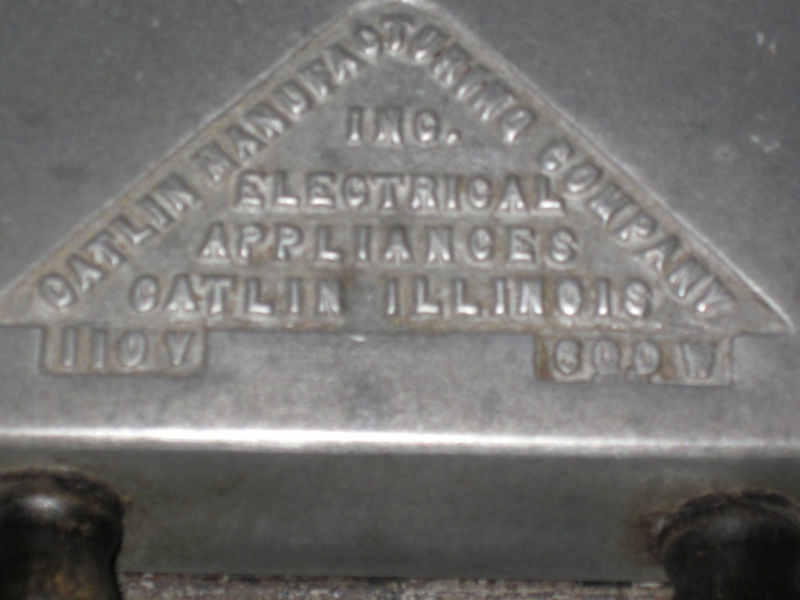 Initially, the plant was in Catlin, Illinois and as the company grew, it moved to Danville, Illinois. 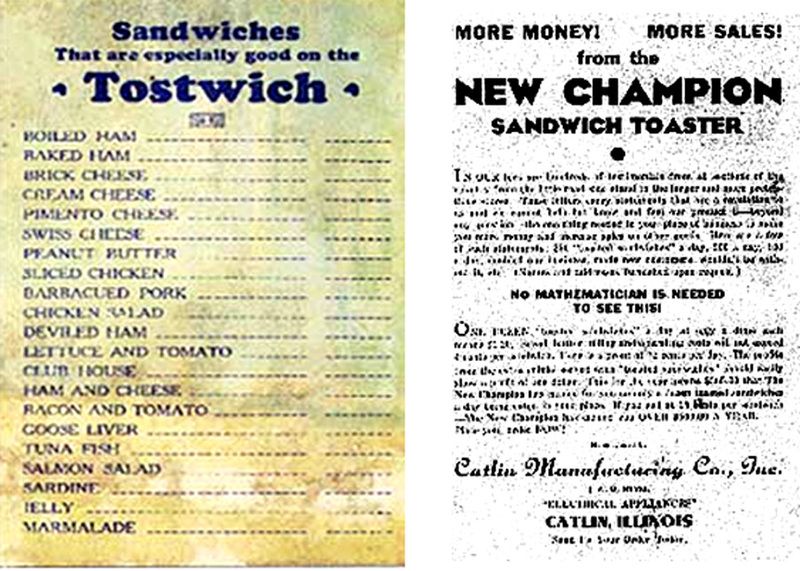 We have found a "Menu Card" that was intended for the drugstores, diners and restaurants where the "Tostwich" was intended to be used. The proprietor could fill in the prices. "... Hi there! 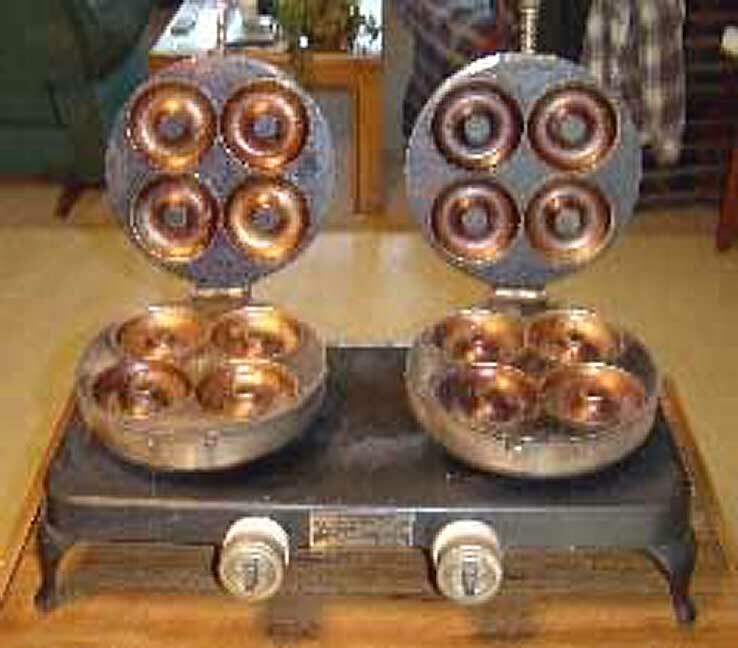 I ran across your website today while doing a Google search for antique waffle makers. 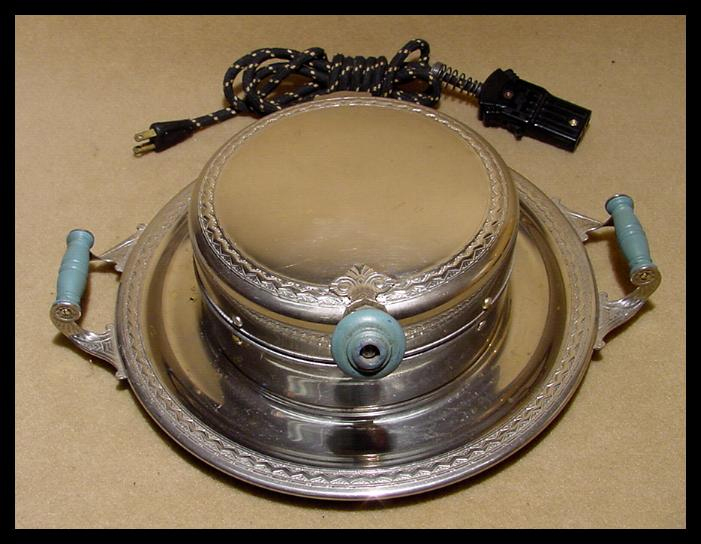 I bought one and am thinking of spiffing it up and using it, but I can't find ANY information on it anywhere! I was wondering if you'd heard of it. It's called the Self-Timer Waffle Iron and is made by the Self-Timer Waffle Iron Company of Chicago, Illinois (pretty creative name, huh?). I'm attaching some pictures. Any help you could give me in identifying this machine would be great. .."
I have never seen this model, although it looks suspiciously like a Bersted Appliance. Please write to us if you have any information on this model. 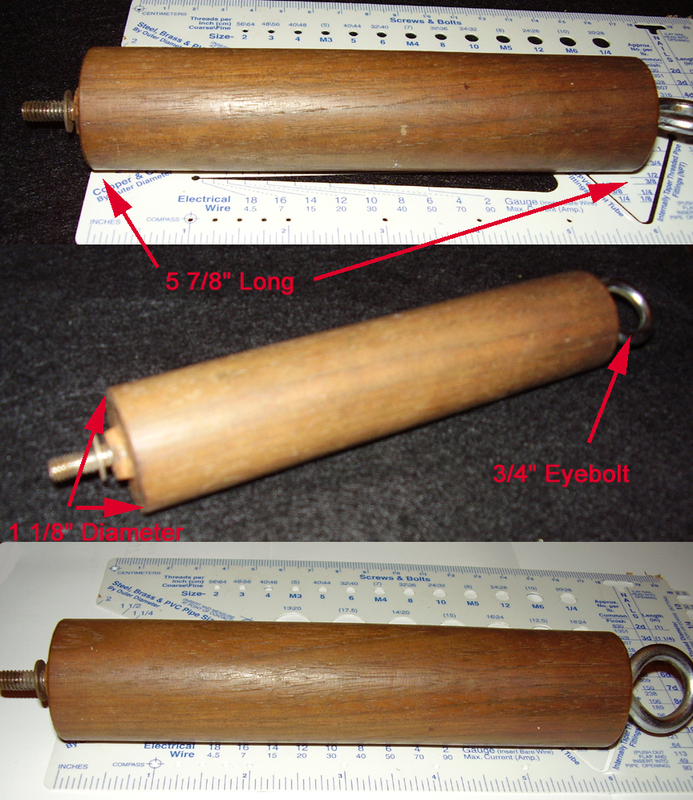 A 1950s "Ringer" for the "Ringer"
This is a very clever gadget. It was knocked off in the 1950s and I fully expect it to be knocked off today in Asia and sold through an infomercial on American TV. 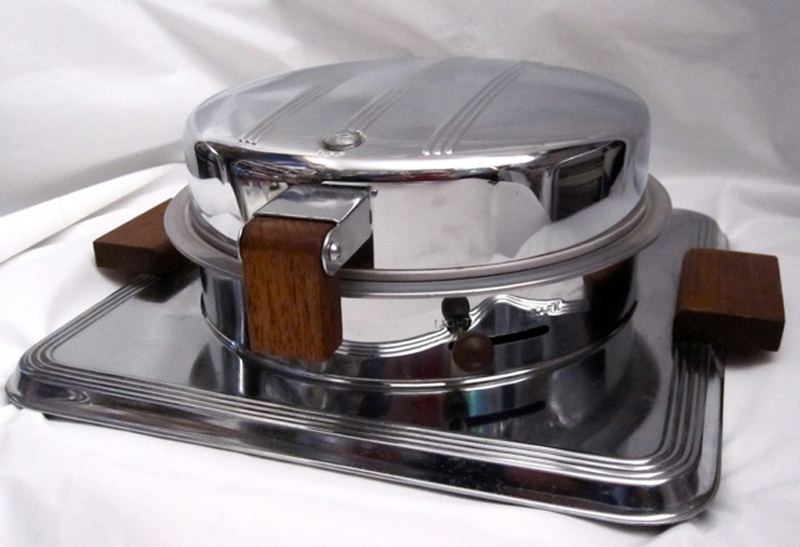 We are including a look at Table Broilers here because they are part of the "make it at the table" ethos that prevailed when electric appliances were relatively rare and consequently tres chic. Wealthy hostesses missed no chance to show off their shiny new appliances. 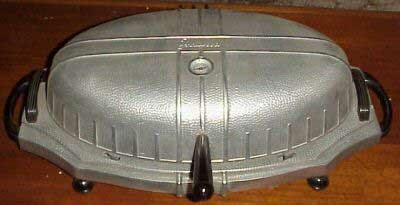 In turn, companies like Manning-Bowman sold appliances that were more like chrome sculpture. When appliances became more commonplace, they were removed from the table and relegated to the kitchen. 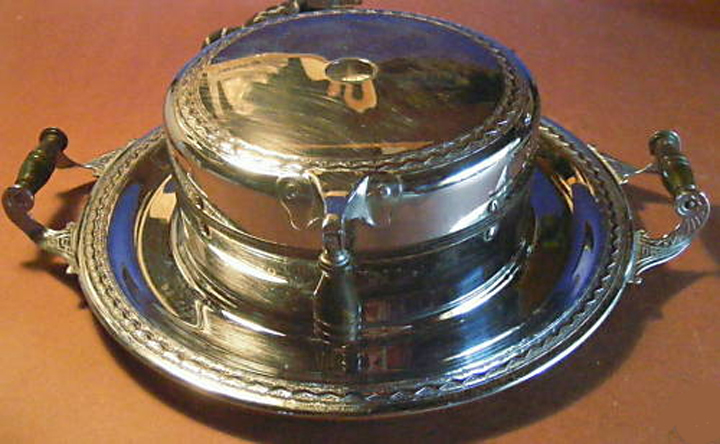 In the "Covered Mode", the chrome "Dome" is hinged to the base and can be lifted with the wooden handle. 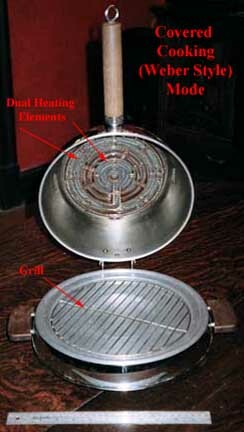 Food is placed on the grill and the cover is lowered. The cord is plugged into a receptacle shown in the previous photo. 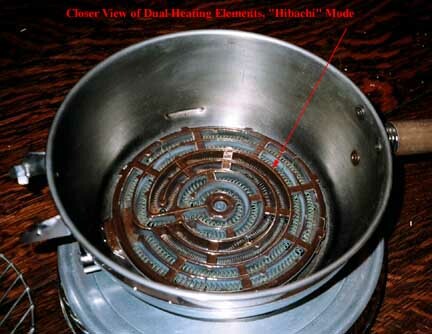 The receeptacle is ingenious in that it has two ways of plugging in the cord -- one only activates the inner heating coils ("LOW") while the other connects both the inner and outer coils ("HIGH"). This is the only temperature regulation available -- and the thing gets quite hot! Here are some sample pages from the Manual. If you would like a free ".pdf" of the Smokeless Table Broiler Manual, please Contact Me; the file is about 1MB, so you should probably have a high speed internet connection. 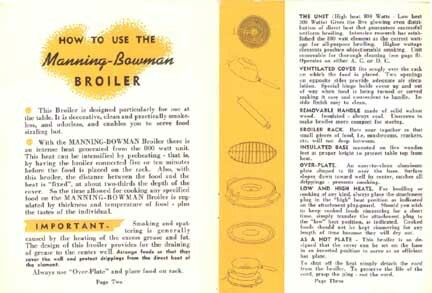 The Manning Bowman Broiler is rare rare because it is a gigantic hunk of chrome which was a prime target for those patriotic "scrap drives" during World War II. I really like mine. 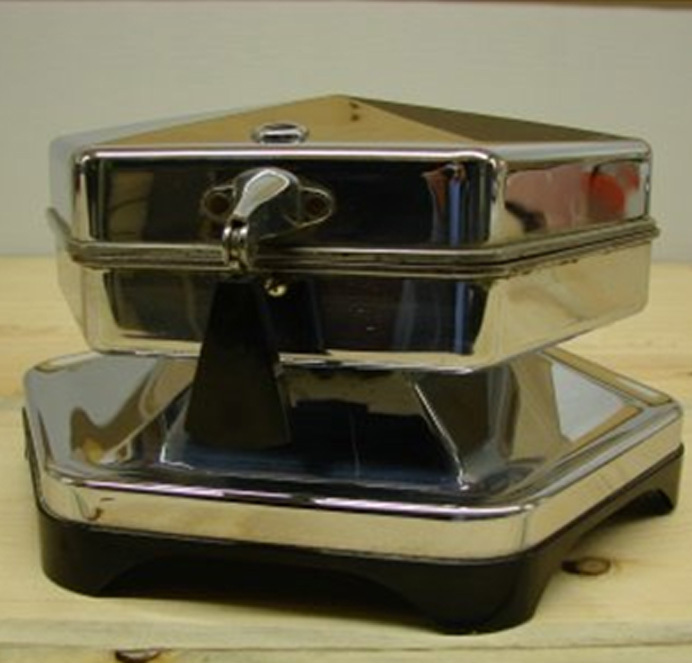 Here are some very nice photos of a Manning-Bowman Broiler and a hard-to-find "Heat-and_Serve" (made by the Chase Art Metal Company) that were sent in by our friend Sherri. Send us photos of your M-B Broiler! "... I just found one of these without the handle, so I'm trying to make one for it ..."
Glad to be of service, Dave! 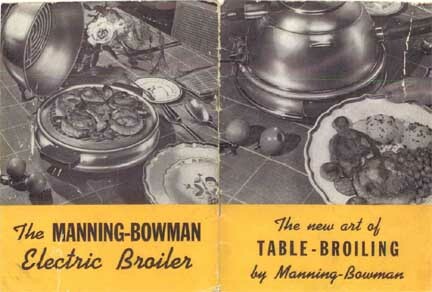 Here are two ads that show the Manning Bowman Smokeless Table Broiler in direct competition with the Farberware Broiler Robot. These ads came from facing pages in the September 18, 1941 issue of LIFE magazine, and are a very rare example of head-to-head competition. The Farber item was priced $2 less than the M-B appliance. They were still both expensive! 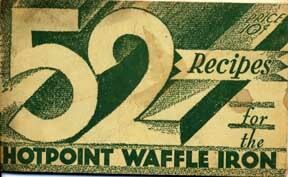 $7.95 and $9.95 in 1941 would be approximately equal to $168 and $210 in terms of 2005 purchasing power. We note that the Manning-Bowman folks were practically "giving away" a very nice serving platter (for an extra $2) if you bought their broiler. One of my readers sent in the following photo of a Farber Broiler Robot in action. 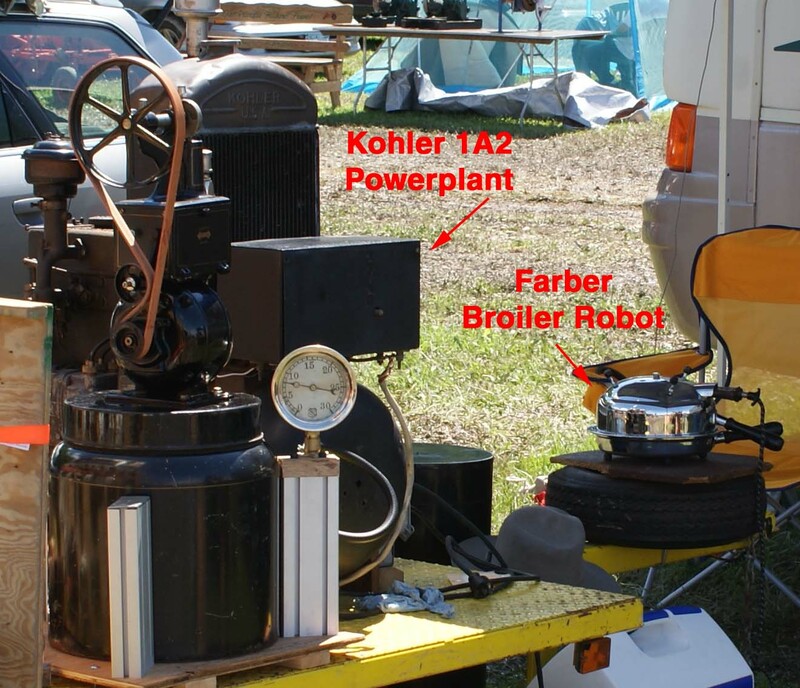 This is reader Frank cooking a steak in the Robot while generating power from a Kohler 1A2 portable power plant. 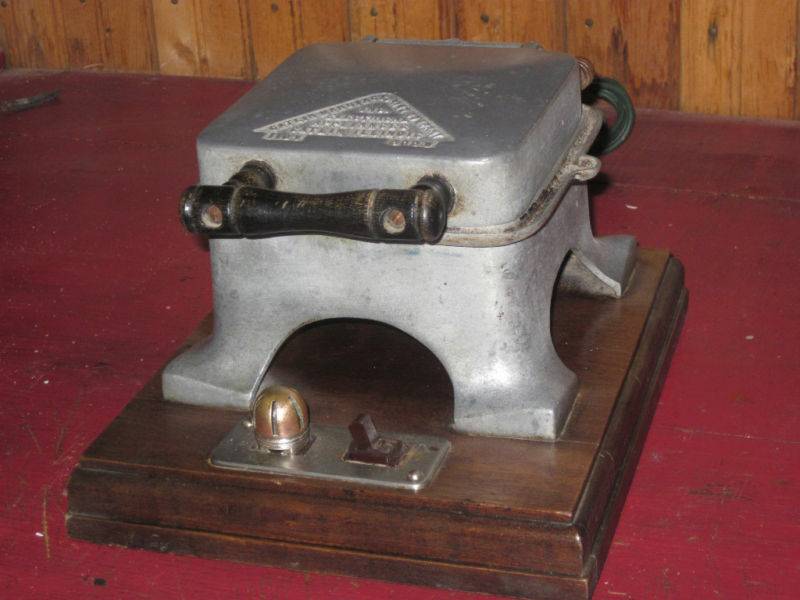 This is the kind of gasoline generator that would have been used on farms prior to the Rural Electrification Administration. Frank brings his generator to various shows -- he has quite a nifty rig there! 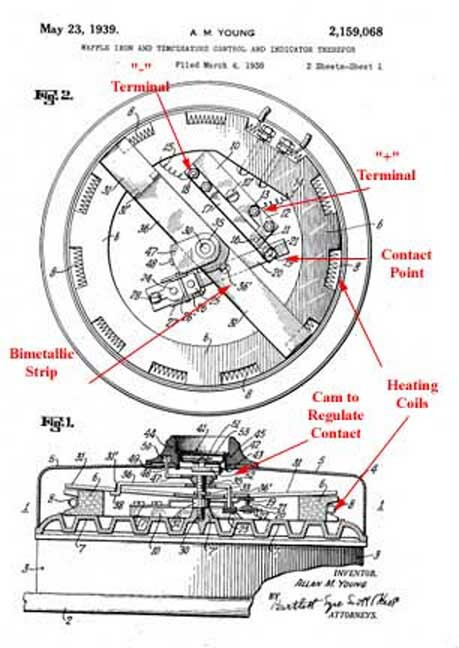 The Smokeless Table Broiler was invented by William C. Rehm of Meriden, Connecticut in December of 1939. 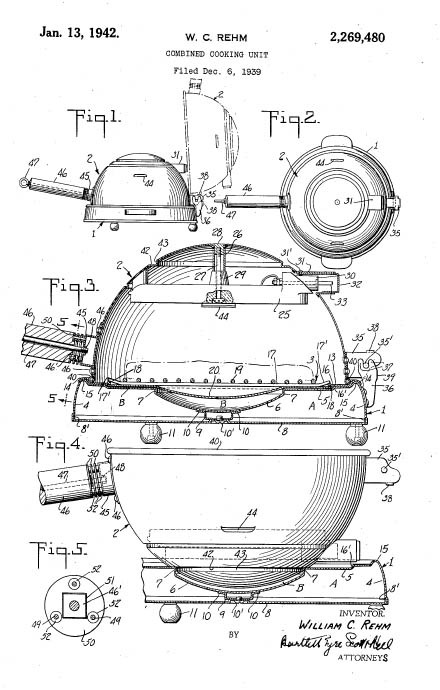 Patent 2,269,480 was granted on January 13, 1942 for the broiler as ".. a novel and improved combined cooking unit for roasting, broiling, frying and other cooking operations.... 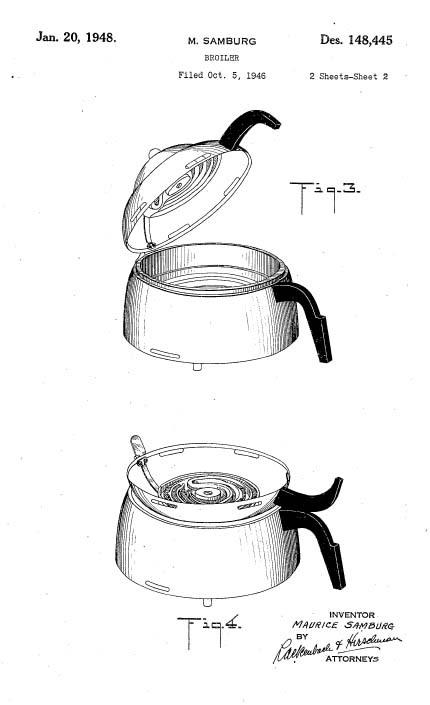 This is one of the most artistic patent diagrams that I have found todate. 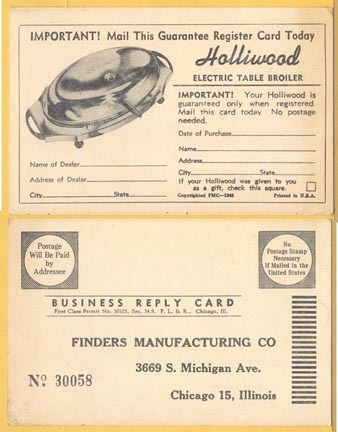 Holliwood followed with a design for an ornate broiler in 1944 and Farber got into the business in 1946 -- with a broiler that very closely emulates the Manning-Bowman version. There are two types of waffles: American Waffles (made with baking powder) and Belgian Waffles (mostly made with yeast). You can make either of them in your Twin-O-Matic. They are about 100% Carbohydrates, so Atkins people will have to just watch what goes on here. This is a standard waffle recipe that was part of the instruction booklet for the Twin-O-Matic and is still being recommended by waffle iron companies. Preheat the waffle iron. Sift the dry indredients into a medium sized bowl. Separate the eggs, putting the egg whites in smaller bowl. Beat the egg whites until they are stiff. (If you are using an electric mixer, you can beat the egg whites first, then beat the batter without having to wash the beaters. The reverse is not true. If you beat the batter first and you have to wash the beaters before beating the egg whites.) Add the egg yokes, oil and milk all at one time to the dry indredients. Beat until there are no lumps in the batter. Fold the egg whites into the other batter using a spatula or other flat utinsel. Put a full 1/2 cup of batter in your waffle iron to make a 9-inch round waffle. This recipe makes about eight 9 inch waffles. Adjust the quantity by volume if you have an older waffle iron that maxed 4 or 6 inch waffles. You can freeze waffles -- why pay the Eggo people to charge a lot for something that you can make cheaply. After the waffles have been cooked in the waffle iron, put them out on a cooling rack. When they are cool, place them in a plastic bag taking out as much air from the bag as possible. Then freeze the bag of waffles. The next time you want a quick waffle, microwave one from the freezer for about 45 to 60 seconds. They are almost as good as fresh waffles. In Belgium, snack bars and waffle houses serve Brussels waffles, with a very light structure and baked in slightly bigger irons with coarse squares. The "sugar" waffles are much sweeter; they are smaller again and no yeast is used for the dough (they are usually called "waffles from Liege"). The best waffles are obtained by using yeast for the dough. You can also use self-raising flour or baking powder, but the result is not as tasty. Alas, waffles with yeast cannot be stored for longer than one or two days. You should eat them during the baking or as soon as possible afterwards (warm them up in the iron which was used for the baking). Most recipes use melted butter. Butter should be heated very carefully and it should certainly not boil! You can use a double boiler to melt the butter or a microwave if that is more convenient. 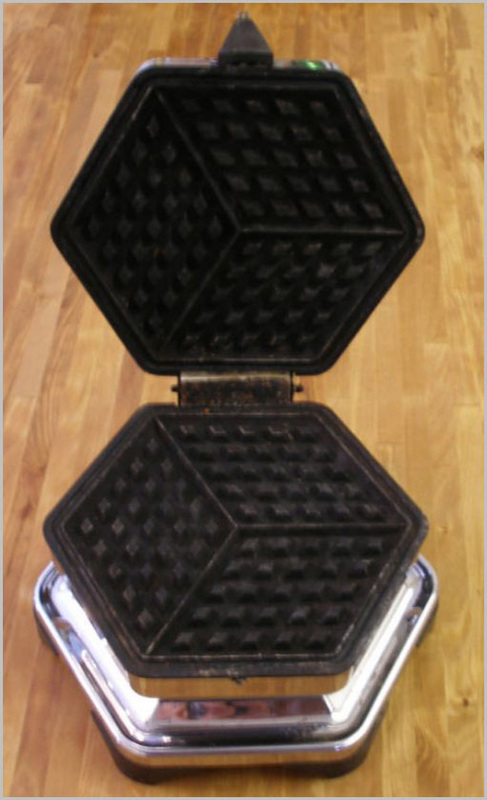 I don�t think that the geometry of the waffle iron (shape, or depth of indentations) has any effect on the taste. 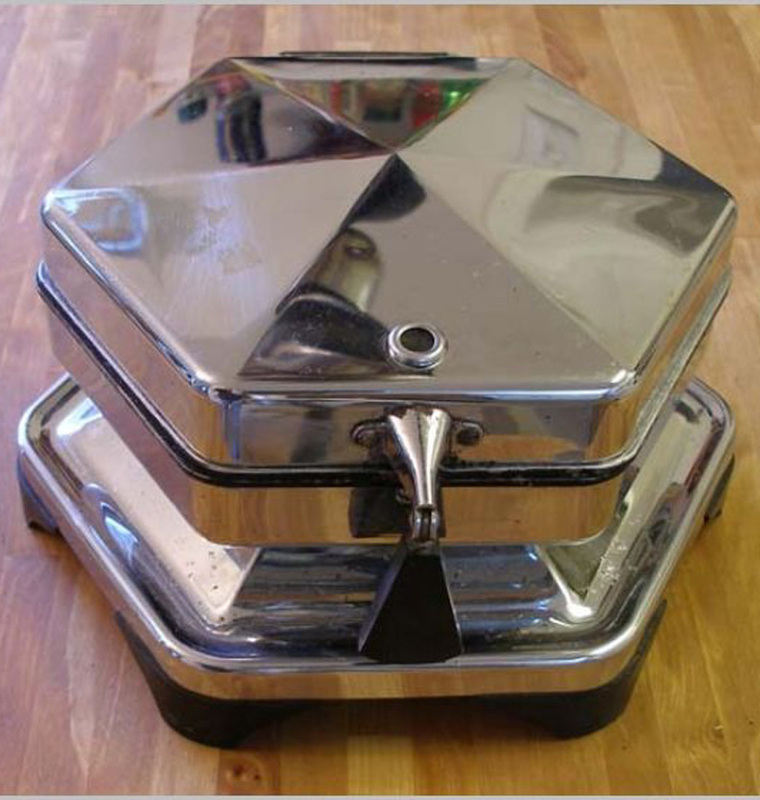 Grease older waffle irons with some oil or melted butter before you begin to bake. I have had some success with spraying the hot iron with aerosol cooking oil like PAM. 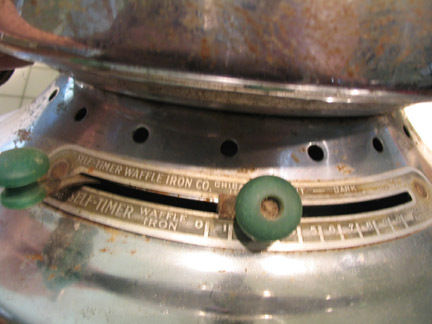 If waffles get to stick to the iron, dig out the mess and re-grease the iron. Modern teflon waffle-makers do not need any surface treatment. However, with some practice and seasoning, nothing ever really sticks to a well-cared for waffle iron. Eat them with butter and sugar or top with fresh fruit and heavy cream. Allow the liquid to come to room temperature. Reserve one cup of the liquid and dissolve the yeast in it. Sift the flour into a bowl; sprinkle the salt at the edge of the flour and make a hole in the middle. Pour the dissolved yeast and the melted butter into the hole. Then, add the egg yolks, the sugar and the remaining liquid into the hole. Scoop the sides over and mix the ingredients. You may also do this with a mixer and a dough hook. Knead the mass from the inside out until you have a homogeneous dough. If necessary, dilute it with a little additional liquid. The dough should be "spoonable" but not as runny as pancake batter. Whisk the egg whites and cut them into the dough with a knife. Cover the dough and leave it to rise in a warm place until its volume has doubled. Pour the dough onto the heated and greased iron. Close the iron immediately and bake the waffle until it gets golden brown. Warm the butter in a double boiler until it is almost melted. Mix the 1/2 pound of sugar with the butter. Whisk the eggs into the mixture, one at a time. one for one, into the mass. Fold in the flour and the vanillated sugar, stir vigorously and add the oil. Continue until you have a homogeneous dough. Heat the waffle iron and grease it. Pour the dough unto the iron with two teaspoons (one in each hand). Bake the waffles golden brown. In Belgium and in the US, "Waffling" is a term for political indecisiveness. "Waffles from Liege" is a synonym for less-than-reliable pronouncements from government. If you want to impress your guests, serve them sugar waffles, and NOT "Waffles du Liege."